First Quarter Finish-A-Long link up!! 1. My commissioned quilt is DONE!! 2. My original plan for our master bedroom quilt changed. I had planned on making a quilt out of Flea Market Fancy and linen but once the top was done, the color scheme just wasn't working for my master bedroom. So I don't know if this counts or not but I did finish a master bedroom quilt just not the original plan. 3. I was able to finish the diaper bag and I love it! If my hubby and I ever have a little one of our own, I will definitely be using this pattern! 4. And last but not least. I was able to finish my FMF pillow cover. This was my first experience with curved piecing and it wasn't as bad as I had thought it would be. 5. FMF pillow shams were not finished since the master bedroom planned changed. 6. I have not finished the pincushion/scissor case. I need to hand-stitch everything together and I just can't get motivated to work on this project. I guess I will add it to my Q2 list! At the beginning of March I had a goal of finishing our master bedroom king size quilt, which you can read about here. It has now been quilted and the binding has been put on and it's officially finished! I am so happy with how it has turned out and once we finish decorating the master bedroom I will post pics! The Girl Friday Blog Hop, which is organized by the amazing Heidi, is starting tomorrow over at her blog, Fabric Mutt. If you haven't had the pleasure of meeting Heidi or visiting her blog you really are missing out. She is one special lady!!! This blog hop is all about the office or work area! Since I am a teacher, I have my own desk space that I love to decorate and organize. And over the course of this blog hop, you will get to see some fabulous tutorials to help your work space! I can't wait to share what I have planned. So make sure you go check out Heidi tomorrow and see what she has to share! 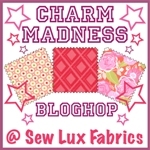 Today is my stop on the Charm Madness Blog Hop sponsored by the wonderful Chrissy of Sew Lux Fabrics! I still can't believe that I was asked to participate with such amazing ladies! So, when Chrissy asked me to join in, I quickly said yes! I love charm packs and have tons of charm squares from swaps that I have participated in. I soon began thinking about what my project would be! 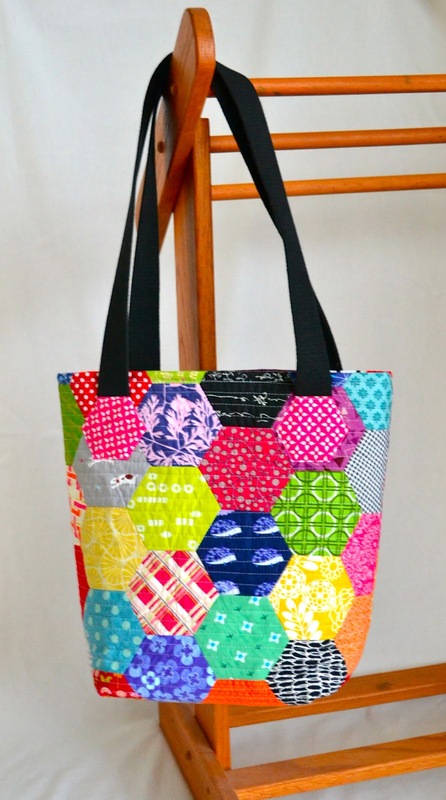 Today I will be sharing a tutorial for an English Paper Pieced tote! This tote finishes at approximately 13.5"H x 11"W x 4"D.
You also might want to consider a snap closure. 1. 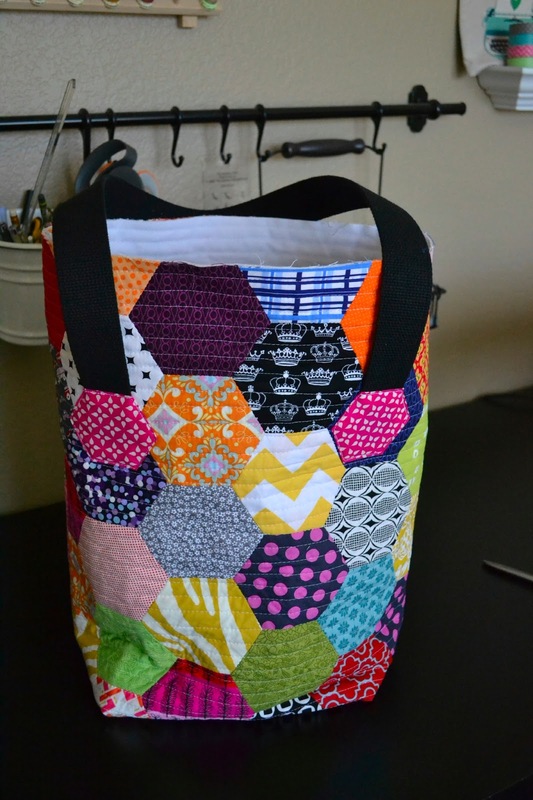 Start by piecing your hexagons! You will need 6 strips with 12 finished hexagons. 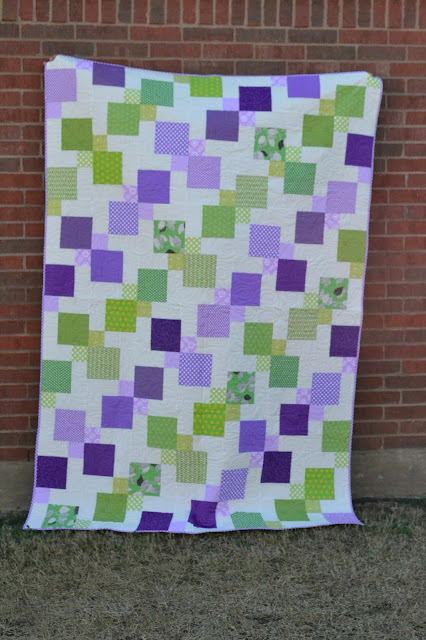 If you are unsure of how to EPP you can find my tutorial here. Keep in mind, if you decide to use directional fabrics you will want to think ahead for that. If you look at the picture below, I have chosen to intentionally position my directional fabrics. The line down the center marks where the bottom of the bag will eventually be. As you can see I have pieced 6 strips with 12 hexagons. For those of you who are new EPP. Now is when you would press your panel and remove your paper pieces. 2. Next, you will need to baste the cotton duck, batting, and hexagon panel. 4. Trim the panel to 17" x 39". 5. Fold both the short ends down 1.75" and press. 6. From the 2 yards of cotton webbing, cut two straps that measure 33", and attach one strap to each end of the panel. The outside edge of the strap is 3.5" in from side. The bottom of the strap is 3.5" down from the top folded edge of the panel. 7. Paper Piece four of the 1.5" hexagons. We will use those to cover the ends of the straps. Once they are basted, press all four hexagons and remove the paper. 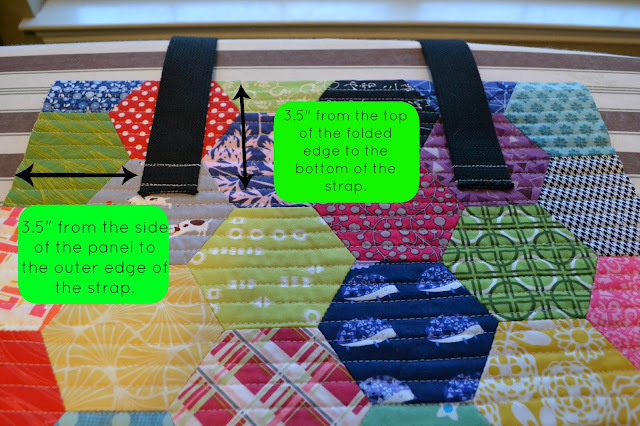 Place one hexagon over the end of one of the straps and top stitch around the entire hexagon. Proceed with the other three remaining hexagons. 8. Once the ends of the straps are covered by the 1.5" hexagons we will start assembling the bag. First, flatten the panel, unfolding the 1.75" fold on both the short ends. We need a flat surface to work with. Then, fold the panel in half, matching up the short ends. 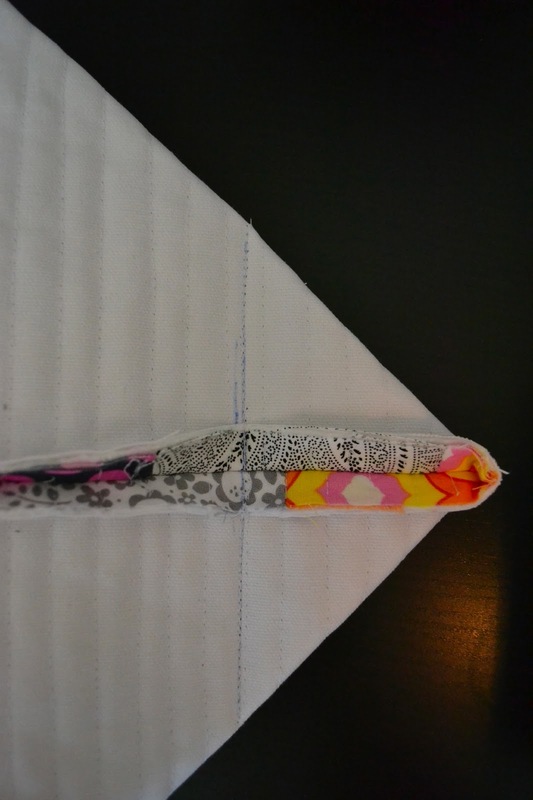 Next, sew down the two long ends using a 1/2" seam. 9. Next, it's time to box the corners. Pinch the bottom edge toward the side seam. 10. Flatten and measure 3" in and mark a line. 11. Sew on that line. 12. Cut off the excess leave a 1/2" seam. Repeat steps for the other corner. 13. Both of your corners should now be boxed! Make sure to press those seams open! 14. Turn the bag right side out. 15. It's time to work on the lining! 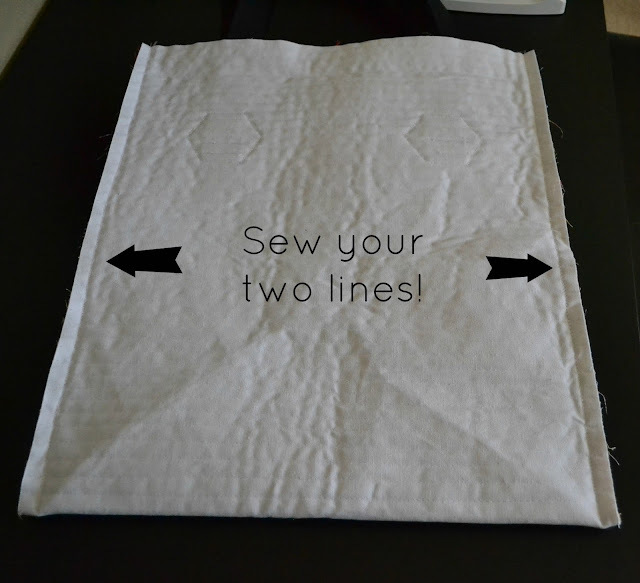 Lay your two pieces of lining fabrics right sides together. 16. Sew a 1/2" seam down each 16.75" side. 17. Press both seams open. 18. Slip the lining around the assembled tote that you have from step #14. 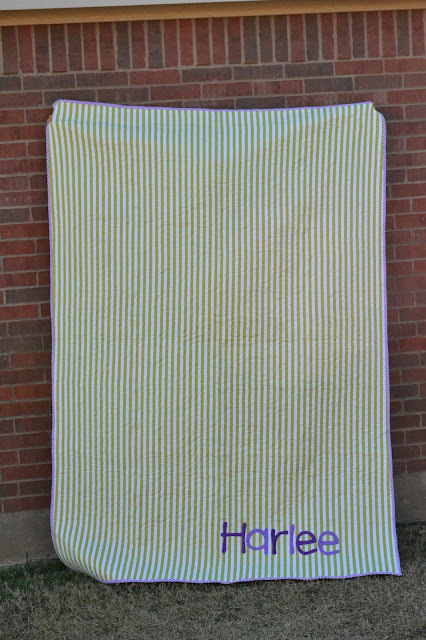 Right sides of the fabric should be together. Line up the seams of the lining with the seams of the assembled tote. You will want to pin or wonder clip the lining in place. Make sure that the handles are not in the way!!! You can see here that my seams are lined up! 19. Stitch a 1/2" seam all the way around the top of the bag. 20. To partially close up the bottom you will need to push the bottom of the bag up and out of the way. 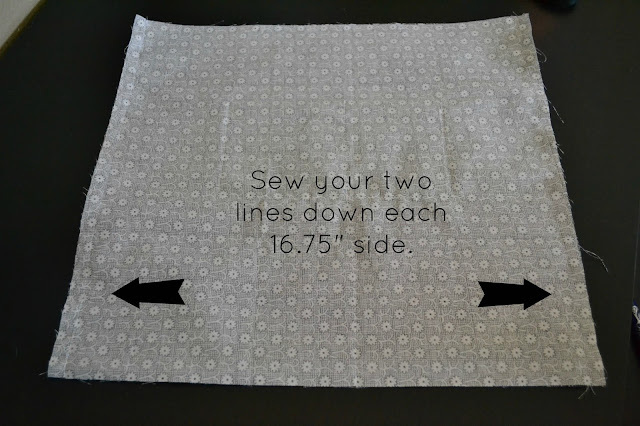 You need to sew a 1/2" seam 4 inches in from each corner. 21. Next, you will need to box the corners like you did with the tote in steps #9-12. Remember to measure in 3" and mark your line. Sew on that line. 22. Cut off the extra fabric leaving a 1/2" seam. Do the same with the other corner. 23. With the opening that is left at the bottom, you will want to pull your tote through! 24. Once you have pulled the tote through, you will be left with this. I added a snap closure to my bag. If you were wanting to do that, now would be the time while the lining is still open. There will be instructions for installation with whatever hardware you purchase. A snap is not necessary though! 25. We need to close up the bottom of the lining. With your machine, or if you want to be an over-achiever, you can hand-stitch the opening closed. I usually close my linings with my machine. I'm the one using the bag and no one will see the inside. 26. Stuff the lining into the bag and turn down the outer panel 1.75". There still should be a crease where we previously ironed it. 27. All we have left is to top-stitch around the top of the bag. I top-stitched about 1/2" from the top of the bag. Now you have a very sturdy bag to tote all of your favorite things around! Giveaway over at Sew Lux Fabrics! I will be participating in the Charm Madness Blog Hop this week! But I thought I would let you all know that Chrissy, over at Sew Lux is hosting the Week 1 giveaway today! So hop on over and enter the giveaway, here! And make sure you go and check out the other tutorials that some amazing bloggers have put together! There are some great projects being made! I have been working on paper piecing projects for quite some time, and some of my readers have mentioned that they would love to learn. So today I bring you an English Paper Piecing Tutorial! One of my long term projects right now is an English Paper Piecing (EPP) project. This project will take me forever, and I am quite all right with that! I love EPP and I hope that you will find that you begin to love it too! First off let me say that there are many different ways to English Paper Piece, I will share my methods with you today! Okay, let's get ready to have some fun! 1. Start by using the glue pen on one side of the paper template. 2. Place sticky side of the template on the center of the wrong side of the fabric. 3. Trim the edges, I usually leave a 1/2" allowance on all sides. 4. Lightly glue one edge of the hexagon. 5. Fold fabric over and press along glued edge. 6. Fold next edge over as well. 7. Get your needle and thread ready! It's time to sew! At NO point will you sew through the paper template. With your needle sew through the first fold. 8. Pull the needle through and repeat. 9. Fold over next corner. 10. Sew through the fold again. 11. Pull needle through and repeat. 12. Repeat the process until you have have completed all corners of the hexagon. 13. 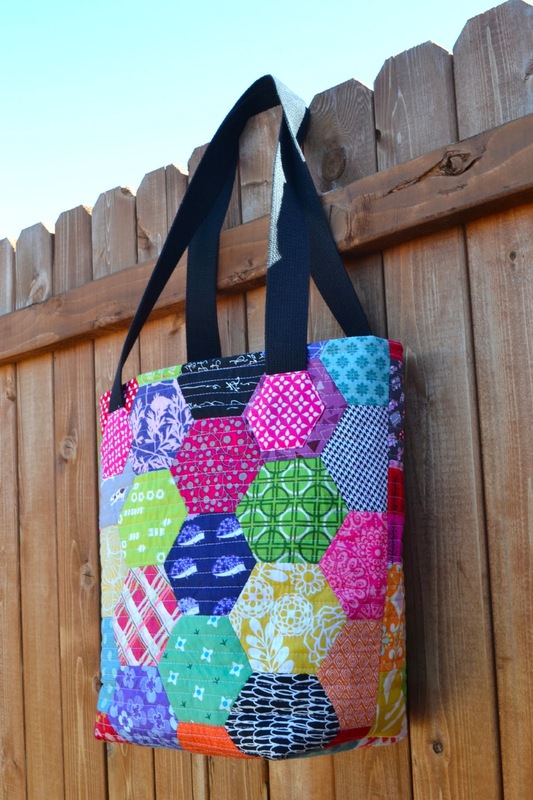 Once you have two hexagons based, you can join them together with a ladder stitch. First place hexagons on top of each other right sides together. 14. Start at one corner. Sew through both hexagons. Your needle will go right below the top edge of the hexagon and right above the paper template. Pull the needle and thread through. 15. Come back through the other side, just a bit over from the first stitch. Pull the needle through. 16. Continue the ladder stitch until you reach the other corner. 17. When you reach the other corner tie off the thread, and you're done! It's as easy as that, the ladder stitch will be your best friend! Now go have fun English Paper Piecing! 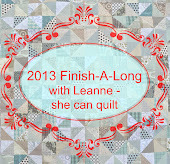 A Lovely Year of Finishes: March Goal!